From being playful and talkative to being highly critical. In just a few months, Rudra’s cancer has intensified and needs additional cycles of chemotherapy to survive. As he suffers in pain, he needs to start as soon as possible but his parents don’t have anything left to save him. Only 2 years old, Rudra was an extremely active child for his age. He would play, climb, run around and do just about anything you’d expect a playful child to do. He was really talkative too and would talk to every single person he’d meet. Suddenly, things turned upside down for the 2-year-old and he had frequent fevers. In addition, his legs hurt and soon the pain was so excruciating that Rudra refused to walk at all. The pain in his stomach only added to his misery. Shocked, Rudra’s parents decided to get him checked up. After certain tests the doctor told them that Rudra had Acute Lymphoblastic Leukemia, a type of cancer in the blood and bone marrow that spreads quickly and if untreated, could cause death. Seeking treatment, Rudra, Kunj Bihari and Nilikumari, Rudra’s mother, traveled from their home in Jamshedpur to Kolkata. Rudra had to be admitted immediately, and Kunj thought that they had nipped it in the bud and he’d get better. Soon, after the induction phase of chemotherapy, it was found that the cancerous cells present had multiplied and Rudra’s suffering was intensified. Now, Rudra was at high risk with only a 50% chance of survival. 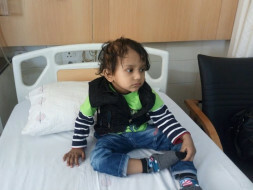 The doctors then put Rudra through a higher dose of chemotherapy for a period of 52 days. This has severely affected Rudra’s mental health. Now, Rudra urgently needs additional cycles of chemotherapy to live. His parents are very strong but are racing against time to save their son. Despite his son going through a lot and because of Nilikumari’s presence, K.B. Roy goes back and forth from Kolkata to Jamshedpur juggling his job and supporting his son. He doesn’t have any other means of support and is giving his sweat, blood, and tears to work more to provide for his son, who is fighting for his life. K.B. Roy works as a laborer at a small manufacturing company. He earns just Rs. 5,800 per month and in that, he looks after his wife, another 5-year-old son, Shauri, and his parents who have retired. He’s unable to save a single penny and has managed to beg and borrow money from his relatives and has paid Rs. 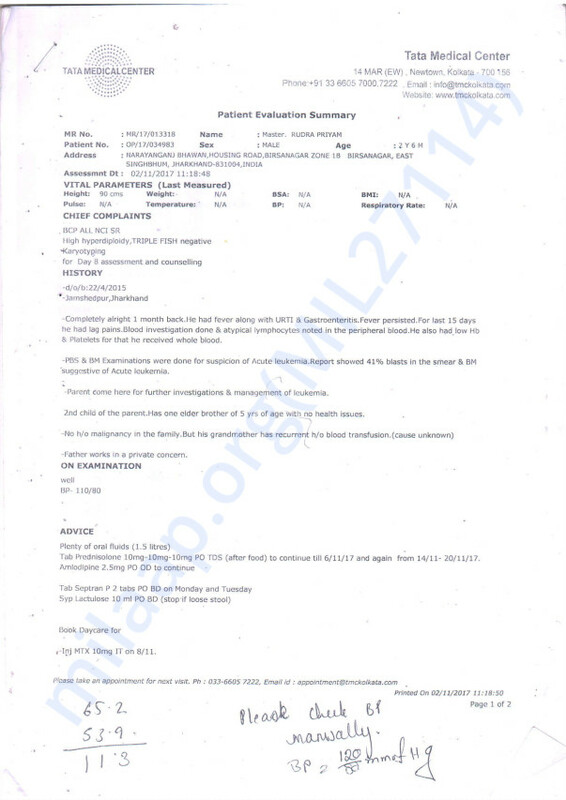 1.6 lakhs for Rudra’s treatments up till now. Now, for additional chemotherapy, the estimated cost is around Rs. 6 lakhs. Even after receiving discounts from the hospitals earlier, Kunj Bihari has no means to pay for this and is running out of time. 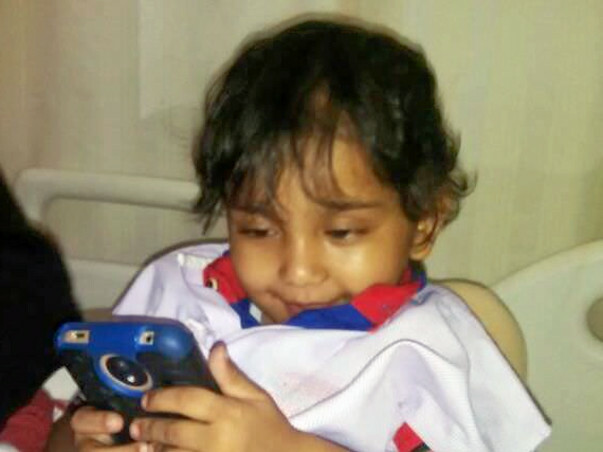 Only additional chemotherapy can save 2-year-old Rudra’s life. His father, Kunj Bihari, has no means of support and has no one left to ask. He can’t afford the treatment and is running out of time to help his son live. Thank you for your immense love and support. Now, thing's are fine and my son has recovered well. We have finally returned to our home in Jamshedpur. He is now happily spending time with his family and friends. Oral chemotherapy is going on with periodical checkup (once in a month). It will be required for more than a year. Due to the very weak immunity, sometime's he fall's sick and requires hospitalization. He has responded well to the treatment and is doing really well. Currently, he is undergoing his last cycle of chemotherapy and doctors are of the opinion that there will be no requirement for the transplant. He is taking medicines as prescribed by the doctors. However, we need to wait and see the progress in his health once all the cycles are finished. Thank you for the love and support you have shown Rudra. Here is an update on Rudra's health. He is still in treatment and he is waiting for 3rd bone marrow aspiration and biopsy for knowing the status of cancer in his body whether it increased or decrease after chemotherapy dose given, his NE (count) in not good so doctors are waiting for if counts comes to normal than bone marrow test will be done for further treatment. Thank you for the love and support. Please share this campaign to help us. May Allah give you cure and help you to get rid of your cancer treatment.